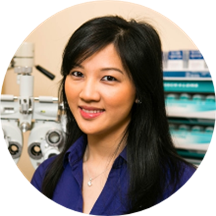 As a Philadelphia native, Dr. Chuong graduated from Temple University with a Bachelor of Science degree before she went on to graduate from the Pennsylvania College of Optometry. She is very passionate about providing high quality eye care to her patients, and her training from the Pennsylvania College of Optometry has prepared her to provide comprehensive eye exams for the local community. Dr. Chuong is skilled in primary care, pediatrics, ocular disease treatment and co-manages with ophthalmologists. With her diverse skill set and extensive knowledge of ocular pathology, patients will receive the best care for their eyes. In her spare time, Dr. Chuong enjoys learning ways to continue to provide the most up-to-date services for her patients. Her commitment to your eyes continues to grow every day. She was amazing! Great personality and very informative. I couldn’t say anything bad if I waned to. Diana was friendly and made me feel at ease. Staffs are very pleasant! Visit was comfortable and concerns were all answered. Highly recommended . Dr. Chuong is so sweet! She was informative, patient with me for the eye exam, and super enjoyable to talk to. Wait wasn't bad and I was in & out in about an hour. Dr. Chuong was extremely pleasant. The whole staff was great. From the moment I walked in I was being helped. Everyone there was so super nice and helpful. I barely waited 5 minutes before I got in to see her, and she was such a sweetheart. The appointment was super quick and easy as well. She was so friendly, nice and personable!! Super friendly and smart doctor. Needed a routine eye exam and she was very clear about my prescription and how I can improve my eyesight. She's incredible. Just the nicest person, I don't know if she actually cares about my personal life, but she surely knows how to make me feel like she does and that's more than I can say for pretty much any otherdoctor I've ever been to. The office is also super, super clean and bright. Which is important tbh. Didn’t wait at all! As a new patient she was eager to learn about my previous eye care and set me up for success with my new prescription. Highly recommend if you’re looking for a new eye care team! Dr. Chuong is good at what she does and always makes you feel welcome and appreciated while she's doing it. Her work is complemented by a team of professionals who, likewise, make customers feel good about every visit. I look forwardto my next visit... which is an interesting way to feel about a visit with a doctor. Very friendly office. Great experience! Highly recommend. Dr. Chuong and the rest of the staff are great! Friendly, patient, and professional. Dr. Chuong was helpful and patient! She spend time listening to my vision issues, and allowed me to try out multiple prescriptions to ensure I was comfortable. The store had a great selection of glasses and the staff was incredibly kindand helpful- they rushed to get my glasses made as I was leaving town shortly thereafter. Thank you! She was very friendly and professional and explain everything she was doing very clearly and allowed me time to ask questions. I look forward to staying a patient here. Super Personable and Sweet ! Best optometrist ever. I'd highly recommend an appointment here. All the staff members were extremely nice and patient, as I was having some trouble with my insurance information they didn't make me feel rushed or seem annoyed with me. I felt like the eye exam was quick but thorough, and they were really understanding of me. All the staff were super friendly; I don’t think I waited five minutes before they called me back. It was a nice quick visit which I appreciated, and I even got a pair of contacts out of it. I would happily use Dr. Chuong’s office again. Super sweet and knowledgeable doctor. Wonderful, helpful staff! I was able to make a last minute appointment which was really convenient. The doctor was very personable and I was in and out super fast! I had a great experience! Dr. Chiang was so sweet and very thorough with my exam! Will definitely be going back. Everyone in the office was so nice and incredibly helpful. Dr Chuong is friendly and patient. The exam was a reasonable price even without insurance. Dr. Chuong was friendly and extremely welcoming. Casual conversation and my eye appointment was probably 15 minutes or less! She inquired about my level of comfort with my contacts that nobody has ever asked before. I really appreciate her candor. Well run practice with great staff! Excellent care! Nice and personable, and immediately pinpointed my eye issues. Very nice person, and a thorough exam. I am very thankfull for the way they threat me very professional. She was kind and very knowledgeable. Everything cleared up within two days, I’ll definitely come back with any eye care needs in the future! Loved the staff. Very personable and professional. There was no wait and they were very patient while I selected my glasses. I'll be making an appointment for my son next. Very informative, patient and friendly. There was no wait, everything was done in under an hour, exam, fitting, etc. The staff and doctor were very nice. There is ample parking in the back of the facility as well. I had a great experience at this location! The reception staff were extremely friendly and helpful in every way possible. I have a tricky insurance plan but the woman at the desk was very understanding and found out my benefits forme. Parking is also readily available which is a huge plus! The office itself is very neat and tidy. I highly recommend this place to others! She’s extremely sweet and personable, but also professional! Had a great visit in a welcoming and friendly environment, I would highly recommend! !